Even if you can’t afford a Tesla or a solar panel installation, there are still many things you can do to reduce your carbon footprint. You might be surprised to know that it’s the smaller (and more affordable!) actions that make the biggest impact, and this is good news for both your wallet and for the planet. Energy efficiency is one of the biggest initiatives in the broader sustainability movement, and with good reason. Energy efficiency tasks need little upfront investment—you see results very quickly and they have a big impact to help us cheaply, immediately and drastically reduce our impact on the planet. Here we’ll detail some of the ways that you can make energy efficiency work for you around your whole house. One of the best things you can do to immediately reduce your energy use (and save money) is to swap out all older incandescent bulbs for LED light bulbs. LEDs are high-efficient, have a really long lifespan and begin paying you back almost as soon as you install them. Also, it’s so simple: all you need to do is change a lightbulb! CFLs are another efficient option, and while these bulbs are cheaper than LEDs, they contain toxic mercury, don’t have as long a lifespan and don’t make as big an impact on electricity usage. 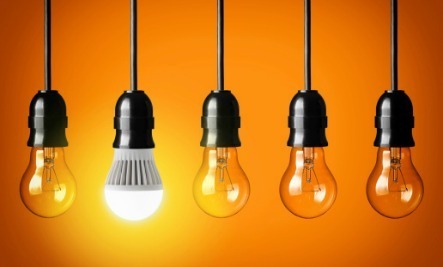 LEDs have a higher upfront cost than CFLs, but show immediate savings and reduction of your energy usage. LEDs are now more available than ever, and come in almost every shape and size for home and business. But how much energy can you save? Cooney says that while most incandescent bulbs are about 60 watts, most LEDs are about 8 watts, meaning your energy use drops almost 90 percent. LEDs have an average 20 year lifespan, meaning that you’ll be saving money for decades. Despite the initial cost, LEDs cost hundreds of dollars less throughout their lifetime. Water efficiency is just as important as electricity efficiency. Water saving devices in the kitchen and bathroom can reduce your need for water draw, but also reduces your need for gas and electricity as less water needs to be heated. The best news is that water efficiency initiatives are even cheaper than lighting. Most current showers push out about 2.5 gallons/minute and faucets gush about 2 gallons/minute. Installing high-efficiency shower heads and faucet aerators can reduce that amount by at least half, saving half your water and a bunch of energy too. Whether you’re stuck in a rental with old appliances or have the newest Energy Star models, it’s important to optimize your appliances to ensure they are using energy efficiently and not wasting. 4. Clean your dryer’s lint trap. Each time you dry a load, remove the lint. Twice a year, clean the main vent that exits the dryer to remove built up lint. This improves airflow and removes the safety hazard of built up lint. 5. Wash your clothes on cold. Most detergents are formulated for cold water, and running on cold eliminates the need to heat the water, and preserves your clothes for longer. 6. Clean out the coils of your refrigerator. It’s disgusting, but it’s so helpful to let your fridge breathe freely. If you have pets, you may need to do it as much as four times a year, says Cooney. All the dust and hair clogs the vents, which makes the fridge run harder, burning more energy and not cooling as effectively. Just use the vacuum brush to clean; some fridges have coils on the back, while others are underneath. 7. Skip the auto-dry on your dishwasher. If you’re lucky enough to have a dishwasher, find the shortest cycle needed to get your dishes clean and then just open after the cycle to let dishes air dry naturally. 8. Make sure your fridge and freezer on on the right temperature. Cooney says your fridge should read 37-40ºF and your freezer 4-5ºF. Anything more or less means that it’s not functioning properly. Always remove frost build up from the freezer too; it’s not actually keeping the freezer cool, it’s making the freezer run harder. 10. Use the right pot size for the stovetop. When cooking on the stovetop, make sure your pot matches the coil size. If it’s too large, the coils will basically heat up the air and waste energy. If you cook with gas, make sure your flame is smaller than your pot to heat just the pan, and not the air. These small changes can add up to hundreds of dollars of savings each year, and immediately reduce the amount of water and energy used in your home. So if you still want to buy a Tesla, you should definitely do it… but if that’s not in your budget now you can still reduce your impact greatly with these simple energy efficiency tasks!